To learn more about Anthony and to view his work, check him out at amairphoto.com. He's also on Instagram and Facebook and Facebook as @amairphoto. 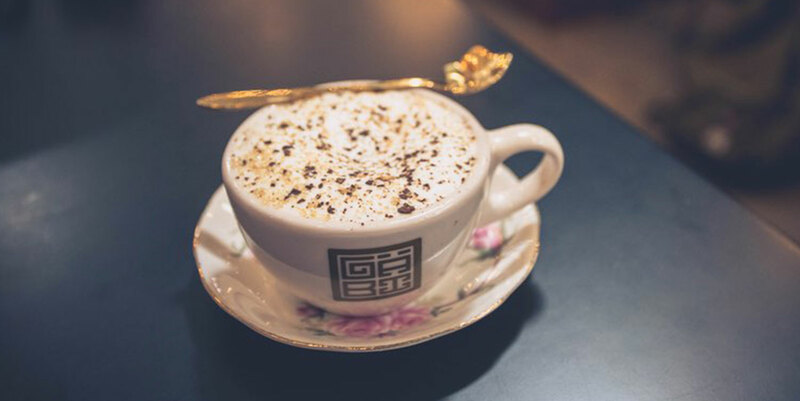 Gäbi Coffee & Bakery is recently opened coffee house located on the western fringe of the Chinatown district of Las Vegas, NV. Although it’s located in a fairly common-looking Las Vegas style strip mall, it’s not difficult to find the entrance to Gäbi. Near the southwest end of the building, Interrupting the nondescript exterior concrete wall, stand an imposing wooden door. Now, we’ve got limited knowledge of history in general, but this door looks like something reminiscent of feudal era Japan. Venturing beyond this door is when the experience begins. The theme is said to be a “Korean coffee shop experience.” We haven’t visited any Korean coffee shops prior to this, so we can’t compare. But with this being our first, we were nothing short of impressed. Upon entering, the interior is overwhelming. It’s obviously a converted warehouse space; but that conversion has been done so well. The walls and floors are concrete, and the ceiling looks like a simple warehouse interior of exposed wooden trusses and ventilation shafts, accented by rudimentary aluminum sheet metal. That combination alone would typically be cold and uninviting, but it really just serves as a stage for the what it contains. Commanding immediate attention is the steel and glass “greenhouse” right in the middle of the space. Just in front of this greenhouse is the ordering counter, which displays coffees, teas, and pastries, as well as an espresso station on the left end. The interior of the greenhouse is their bakery, where they make all their pastries and baked goods. The greenhouse contains several hanging plants, and is also flanked by large trees, which bask in the natural lighting that shines through the many skylights and bounces off of the walls and dull metallic roof. This provides an awesome feeling of being in a quaint, inside park– almost like a greenhouse-in-a-greenhouse situation. The perimeter of the shop has various seating arrangements, ranging from couches and two-tops to rocking chairs and a large stairway-tiered bench structure that also doubles as a bookshelf. This is all accented with wood, faux grass turf, and Asian artwork and furniture adorning the walls and open spaces. Tons of light floods in from the large front windows and skylights, with string lighting, Edison bulb lamps, and track lighting bringing subtle lighting to the shadows. They were sold at MP (Market Price). This creates somewhat of an ambiguous situation when you go to purchase the coffee. It presents a can-I-afford-this situation. Were we buying a live Maine lobster, or a cup of coffee? Maybe an detailed description explaining and justifying– and displaying – this price would alleviate the concern prior to ordering. After asking, it turned out that they were priced around $6, which, is slightly more expensive than most other pour over options in the city. The serving size was somewhere in the realm of 4-5 oz. We viewed this as a fairly small pour. Again, this is in comparison to other pour over services we’ve had. When you couple a 4.5 oz. pour with a hidden $6 price tag, you wonder if the pour over is really worth it. These concerns are only slightly washed away by the flavor and aroma experience while enjoying the coffee. The experience at Gäbi was awesome. It’s the perfect place to stop in for a cup or ten. It’s the perfect place to read a book, or to host a study group. It’s the perfect place to let your kids get some early morning energy out while you read the paper and enjoy a pastry. Oh, and after browsing their social feeds, it also seems like the perfect place to take that cute I-didn’t-know-you-were-taking-my-photo selfie for Instagram. Looking to get into roasting coffee beans? The Kelvin Home Coffee Roaster appears to be the perfect entry level roaster.